The 12th man might be the most die-hard fanbase in the NFL, but its pretty much secluded in the Pacific Northwest. 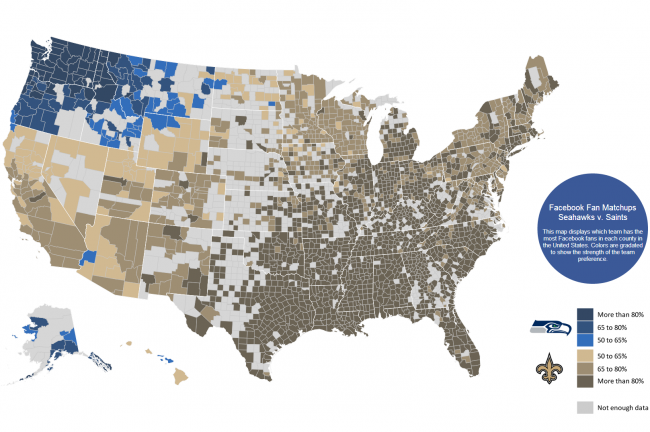 Drew Brees is a fan favorite in the South and this map reinforces that. Well, it is not a spitting fan, but it’s close. Eagles offensive tackle Jason Peters said the Saints “got lucky” with their 26-24 win at Philadelphia on Saturday, according to Geoff Mosher of Philly’s ComcastSportsnet. New Orleans could probably argue both points. Besides holding the NFL’s leading rusher, LeSean McCoy, to 77 rushing yards, the Saints also racked up 434 total yards. Apart from coach Sean Payton being suspended for a year, the NFL stripped the Saints of a pair of second-round draft picks. And while rules technically were broken, the 22-page, single-spaced ruling from former Commissioner Paul Tagliabue overturning all player discipline carried a subtle-but-potent rebuke of his successor for addressing a cultural issue in the NFL not by giving everyone a fair chance to adapt to a new reality but by hammering the one team out of 32 that happened to be caught with a hand in the bounty jar. 1. Back where Who Dat was handed its hat: The Saints were 0-5 in road playoff games in franchise history before defeating the Eagles 26-24 in Philadelphia on Saturday night. Now New Orleans returns to the site of its worst defeat this season, a 34-7 victory by the Seahawks in a Monday night game on Dec. 2. Seattle held the Saints to 44 yards rushing, and Russell Wilson had one of his best games of the season, completing 22 of 30 passes for 310 yards and three touchdowns. PHILADELPHIA – A few thoughts on the New Orleans Saints‘ 26-24 victory over the Philadelphia Eagles in Saturday’s NFC playoff opener, which sends them to Seattle for the divisional round next week. What it means: Can’t win a big game on the road? Can’t win out in the cold? The Saints finally made their counter-argument, making this one of the biggest wins in franchise history. It was their first road playoff win of all-time, snapping an 0-5 skid. They also snapped a three-game losing streak on the road this year. However, it won’t be any easier to repeat that feat next Saturday at Seattle against the top-seeded Seahawks. The Saints’ ugliest performance of the year came at Seattle on a Monday night last month when they were routed 34-7. They’ll need to bring the same run game and defensive effort with them next week that they brought to Philadelphia. Saints win on the road !! PHILADELPHIA — Shayne Graham, signed by the Saints just more than two weeks ago, kicked a 32-yard field goal on the final play Saturday night to give New Orleans its first road playoff victory, 26-24 over the Philadelphia Eagles. Graham’s third field goal sent the Saints (12-5) to Seattle for next Saturday’s divisional playoff game against the NFC’s top seed. The Seahawks routed the Saints 34-7 during the season. Drew Brees threw for a touchdown, Mark Ingram rushed for 97 yards and another score, and the Saints’ defense slowed Chip Kelly’s up-tempo offense just enough. New Orleans had been 0-5 in postseason games outside of the Big Easy since entering the league in 1967. Philadelphia wound up 10-7 in Kelly’s first year as coach. He guided the Eagles from worst to first in the NFC East, but they were only 4-5 at home. Posted in Saints News | Comments Off on Saints win on the road ! !